It is becoming increasingly difficult to deny that human activity is a factor in global climate change. This special volume of REA facilitates readers to better understand the ways in which people around the world have adapted (or failed to adapt) culturally to changing economic conditions caused by climate change. It focuses on specific situations in particular locations, showcasing (and confirming) the strength and value of intensive ethnographic or archaeological "investigation. The authors discuss: 1) How has climate change affected production, distribution, or consumption at the local level? 2) Are environmental conservation and economic development mutually exclusive? 3) What roles can public and private institutions play in successful adaptation? 4) What kinds of parallels can be drawn between current social situations and those in the past with regards to climate change? Institutional Climate Change Adaptation Efforts among the Sherpas of the Mount Everest Region, Nepal. Installing Rooftop Solar Panels in Private Homes: The Case of Small Electricity Producers on Reunion Island (Indian Ocean). “Bug Wood”: Climate Change, Mountain Pine Beetles and Risk in the Southeastern BRITISH COLUMBIA Logging Industry. Conservation Units, Environmental Services and Frontier Peasants in the Central Amazon: Multi-Functionality, Juxtaposition or Conflict?. Global Warming or Cash Economy? Discourses of Climate Change and Food in Eastern Highlands Province, Papua New Guinea. Farmers’ Rainfall Anticipation: Incidence and Patterns in Western Nigeria. Advantages of Focus and Problems of Extrapolation in Case Studies. Climate Change Policies and Adaptive Behavior of Farmers in Southern China. Is Environmental Uncertainty Redefining Fishing Strategies? The Use of the Traditional Lunar Calendar to Allocate Fishing Effort in Ende, Eastern Indonesia. The Origins of the Sustainability Concept: Risk Perception and Resource Management in Early Urban Centers. Merchant Resiliency and Climate Hazard Vulnerability in the Urban Philippines: Anthropological Perspectives on 2011 Typhoons Nesat and Nalgae. Environmental Destruction, Guaraní Refugees, and Indigenous Identity in Urban Paraguay. Copyright page. 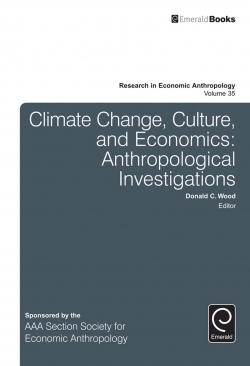 Climate Change, Culture, and Economics: Anthropological Investigations. Introduction. List of Contributors. Research in Economic Anthropology. Climate Change, Culture, and Economics: Anthropological Investigations. About the Authors. Editorial Advisory Board.